SubRosa - a community space: UPDATE! 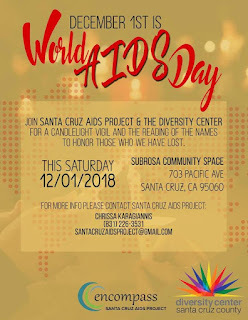 Sat: World AIDS Day event // Sun: Caravan Support (at EXIT Santa Cruz - not SubRosa // Tues: Another Show!! // Fri: Art Show Opening! // Sat: Free Market // & More!!! UPDATE! Sat: World AIDS Day event // Sun: Caravan Support (at EXIT Santa Cruz - not SubRosa // Tues: Another Show!! // Fri: Art Show Opening! // Sat: Free Market // & More!!! Join Santa Cruz AIDS project and The Diversity Center for a vigil, followed by a Triangle Speaker panel & discussion at SubRosa Community Space. Meeting at 816 Pacific Ave (at EXIT Santa Cruz / NOT SubRosa). "Come be involved in planning what's next! // Venga a planificar que es lo que sigue!" -Friday, December 7th, 6pm: Angry Black Girl Magical Realism / An Art Installation by Whitney Sparks / First Friday Event! Art show for December is entitled: Angry Black Girl Magical Realism / An Art Installation by Whitney Sparks and come to SubRosa on Friday, December 7th at 6pm for the art show opening! Whitney Sparks is an artist mother writer and queer Black femme agitator (organizer doula herbalist yoga teacher permaculturist) who grew up in Silicon Valley and Saratoga. She has lived nomadically all around the world and earned degrees from Yale and a Masters in Fine Art from Zurich University of the Arts. -Ancient Future: The Noose as Umbilical Cord ~ this collection of mixed media artwork from 2018 explores the cosmic realm of ancestral knowledge as a powerful magical and/or spiritual force of Blackness that can land on Earth in healing shifting ways/waves for their descendants in the Diaspora. -Migrating Womxn ~ portraits of people traveling in the caravan made to uplift their struggle and above all to RESIST the dehumanizing agenda that threatens their lives. ALL proceeds from these portrait sales will go directly to support the caravan refugees. -Mixed Messages ~Collage postcards by yours truly from around the world. Get $5 off a yearly subscription to these original works of art for 2019 by ordering with the code SUBROSA via whitneysparks@gmail.com, before January 1. Really Really Free Market! No money. No trades. Everything is free. Capitalism NO! But come to the Really Really Free Market to give away your old stuff and/or get new-to-you stuff. Don't be late and be sure to check in with the organizers when you get there.